Digital microscopes offer a lot of extra benefits to users. Danail Kuzarow reports. The world of microscopes has been revolutionised in the past few years by digital microscopes. The advantage to the user is that modern digital microscopes are, depending on the application, easier to use than ocular systems. It is theoretically possible to obtain similar quality results with ocular systems, but in practical day-to-day routine these results are very difficult to be achieve. They require a lot of know-how and a lot of studying of operating manuals to be able to find all functions and capabilities. Digital microscopes are available for simple applications such as taking a good quality picture within a reasonable amount of time - a few seconds. Such systems can be used even in small companies or departments which previously used photo cameras or stereo microscopes. The advantage for these users is that the live microscopic image offers fast observation, high resolution and a very high depth of field. Another advantage is that these microscopes can be upgraded anytime due to a compatible modular system. Because of this flexibility the user can expand or change the usage of the system anytime. Large samples can be observed without having to be destroyed because the zoom lens and camera systems of digital microscopes can be connected to standard photo stands or even used mobile directly on the sample. With special anti-vibration proof stands available for some of the most common digital microscopes, it is also possible to achieve magnifications of up to 5000x (up to the limits of wavelength of light, approximately 350-500nm depending on whether white or blue light is used). For high magnifications microscope lens revolvers are in many cases so close to the observed target that they almost touch it (less than 1mm working distance). For digital microscope systems with special zoom lenses even at high magnifications it is possible to achieve high working distances (for example manufacturer Keyence introduced a lens which has 85mm working distance at 500x magnification and at 5000x still 4.4mm). It is not only possible to tilt the lens and use different angles of light even at very high magnifications, but it is also possible to chose from a variety of light options. 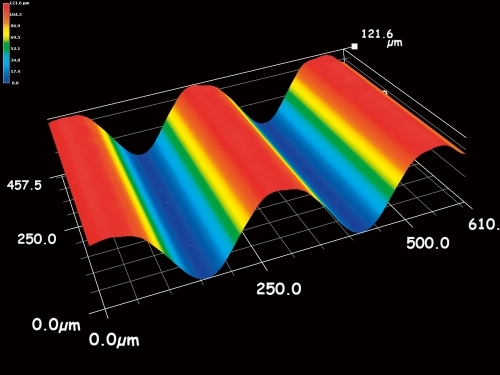 Despite light options, such as differential interference contrast or polarized light, it is also possible to work with dark and bright field illumination with one lens. Even at high magnifications the light angle can come from the side so that a shadow can be created. Such shadows make scratches and embossments visible which exist on the sample, but cannot be seen if the light comes directly from the top through the lens itself. Some digital microscopes use advanced graphics systems and graphic controllers which are connected to the camera and are matched to the zoom lens resolution. This is an advantage because then it is not necessary for the camera to downsize the resolution of the lens. Also, it is then possible to use special light-sensitive CCD chips which deliver a good quality image with a high depth of field even when the aperture of the lens is reduced. The software of these modern systems are directly matched to the graphics system and technical capabilities. This can be compared to a good smartphone or tablet PC. Such modern computers are so easy to use that even non-experienced users will have fun to use the systems and will easily find out how to deal with the functions. The design is made in a way that the system itself does the work and that the user just has to 'use and apply' what he wants to be done. Of course, a modern microscope system is a little bit more complex than a smartphone or tablet PC, but such systems are better if they are equipped with an online help menu that graphically shows the options of certain functions. The software options of modern digital microscopes include 2D and 3D measurement functions (for example by using motorised stages and motorised zoom lens movement). Keyence has released the latest version of its digital microscope product line VH. 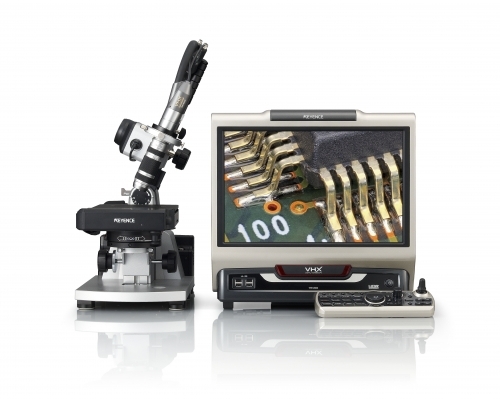 The VHX Series Digital Microscope can observe, measure and record - all within a single system. It combines the capabilities of a conventional stereomicroscope, compound microscope, and metallurgical microscope. It achieves a 0.1x - 5,000x magnification range. One of the main benefits of this digital microscope is its large depth-of-field, making it possible to inspect an object from any angle and perform 2D/3D observation and measurement.